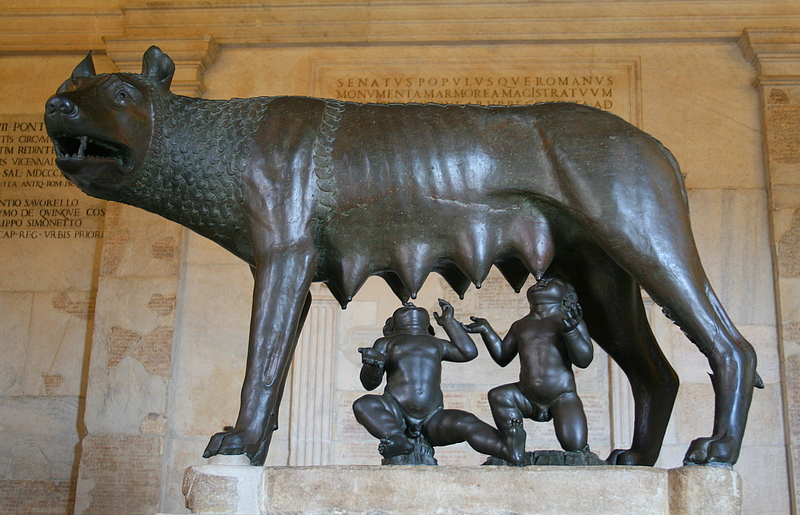 Lupa Capitolina: she-wolf with Romulus and Remus. Bronze, 12th century AD, 5th century BC (the twins are a 15th-century addition). Palazzo dei Conservatori, Hall of the She-Wolf. The Ancient Romans are, I suppose, best known for their ambitious and sometimes mad emperors, military conquests, rather unsavoury treatment of Christians, gladiatorial contests and their chariot races. And their roads. Oh yes, and their aqueducts. We shouldn’t forget their aqueducts! But stop for a moment and try to think of a famous Ancient Roman artwork or even type of art. Not that easy, is it? Indeed, for most people, what springs to mind when they think of Ancient Roman art, is most likely architecture. It is true that the Romans produced stunning mosaics, and the wall paintings in Pompeii are renowned, as I have described in an earlier post. 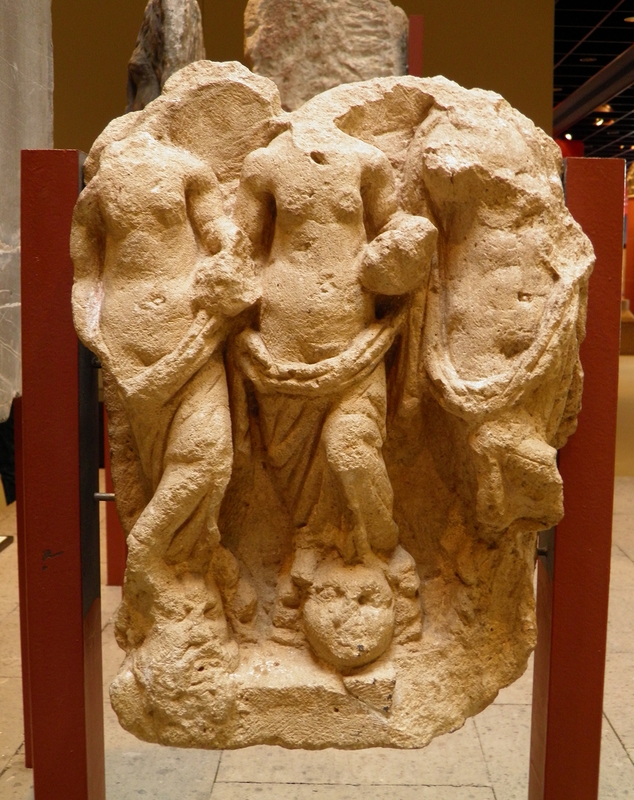 But much of what we think of as ‘Roman art’ was heavily influenced by Greek culture of the Hellenistic Age. Most of the ‘Ancient Greek’ statues in modern museums are actually Roman copies of the originals. And many Greek gods and myths were simply adopted by the Romans, with name changes, of course. The Romans, busy conquering the world, filled the cultural vacuum with all things Greek and relied on Greek artists to decorate their world. But their art did evolve. And their depiction of rivers is testament to that. Unlike the Greeks, whose focus was the ocean, the Romans established themselves on the River Tiber. The founding of Rome is based on the myths of Romulus and Remus and the river itself. Somewhere around 750 BC, King Numitor of Alba Longa had an argument with his brother, as brothers often do (I know I did) and was banished. The brother, Amulius, killed Numitor’s sons and forced his daughter, Rhea Silvia, to become a vestal virgin. Seems a bit harsh to me, but there you go. I usually only kicked my brother in the shins and stole his chocolate bars. Mars, captivated by Rhea Silvia, ravished her and from their union, Romulus and Remus were born. Amulius was not at all happy, as you can imagine, and threw all three into the Tiber. Rhea Silvia was saved by, and eventually married, the river god Tiberinus, who also rescued Romulus and Remus. Tiberinus gave the two boys to Lupa, a she-wolf, who had, conveniently, just lost her own cubs. She gave the twins milk and they were fed by a woodpecker. They were then raised by a shepherd and his wife and went on to found Rome. The Tiber holds a particularly central position in the history and indeed the geography of Rome, but Romans, throughout their long reign, venerated rivers, springs, fountains, waterfalls, lakes and indeed, all sorts of water bodies. Rivers were the source of water and in many cases, had healing and cleansing properties. Living near to a large river gave a Roman status, and the boundaries rivers formed had political and jurisdictional functions. Rivers also formed barriers to invading armies and could be devastating in their destructive powers when in flood. So it is not surprising that Roman generals sometimes gave thanks and sacrifices for being able to cross rivers safely. Relief dedicated to the nymphs who insured good and sufficient water, Romisch-Germanisches Museum, Cologne. Carole Raddato, Wikimedia Commons. Quasi-religious dedications to springs, creeks, rivers and the nymphs that looked after them, were common from people from the most lowly ranks – even slaves – to those who held the highest positions in the Empire. Statues were sometimes erected in rivers as dedications. But more commonly, plaques were inscribed and garlands of flowers thrown into the water body. Springs seem to have been the most venerated of all water courses, presumably as sources of drinking water and for cleaning. And perhaps, because springs often dried up during summer, their seasonal reappearance was anxiously anticipated and something to be thankful for in an age when water storage was uncommon. The larger rivers had a special place in the hearts and minds of Ancient Romans. When describing their birthplace, people would often mention the river with which their village or town was associated. And the largest rivers were often given the prefix ‘Father’, an indication of their revered status. River confluences were particular special, and often alluded to when writing of one’s origins. Brian Campbell’s wonderful Rivers and the Power of Ancient Rome for a detailed and fascinating description of what rivers meant to the Ancient Romans. I rely on his descriptions for much of what follows. River Nile, Vatican Museum. By Hans Weingartz, Wikimedia commons. As I’ve described, rivers were perceived by post-Hellenistic-Age Romans as more than simply bodies of moving water. They were entities that at times brought life and prosperity, and at other times could wreak devastation through the power of their floods. It meant that they were revered, but also feared, and so had to be appeased through offerings and sacrifices. Their mood could shift from one of benevolence to malevolence in the matter of hours. They were unpredictable, unfathomable, seen as even spiteful, by a people with only a limited grasp of the hydrological cycle and a belief in polytheism. So, it is not surprising that Romans in their art mostly personified rivers. In the pre-Roman-era, rivers typically took the form of a bull or a man with a bull head or, later, just horns, like Acheloüs, who was defeated by Hercules in a disagreement over the water nymph Deianeira. Hercules ripped off one of Acheloüs’ horns, which was turned into a cornucopia, or horn of plenty: another river symbol which turns up repeatedly. 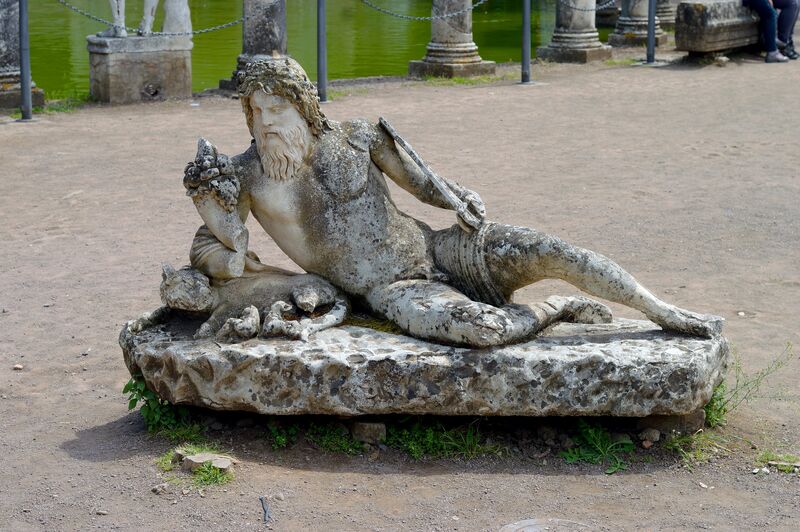 But gradually, rivers became more human and less bull-ish, until, throughout much of the Roman era, they were almost all represented as bearded, reclining men. Actually, rivers were mostly male and springs mostly female. Long, flowing beards, hair and robes reminded the viewer of flowing water. Heads were often crowned with reeds or other water plants and urns were commonly carried, with water flowing from them. Rivers tended to recline, springs stood or sat. 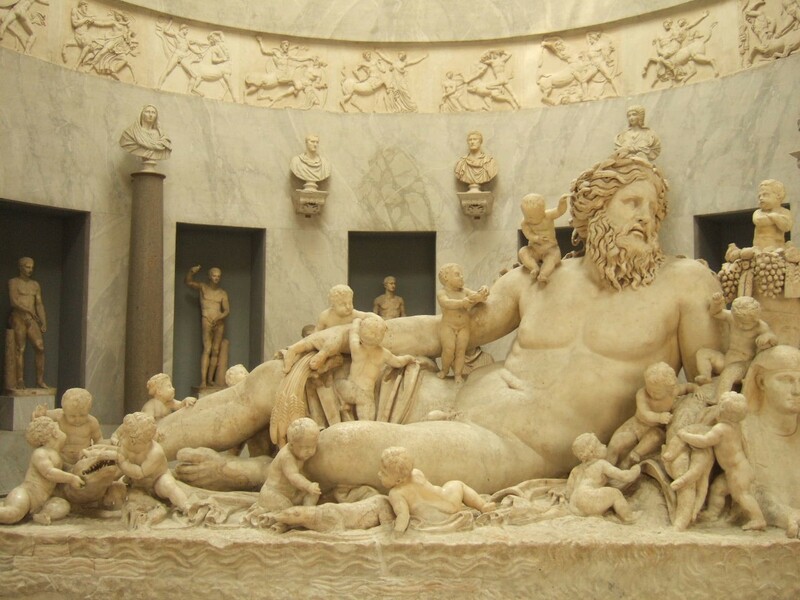 Depictions of the Nile, a particular favourite of sculptors, started with the Greeks and was continued by the Romans. He was usually a reclining, bearded male, sometimes leaning on a sphinx (see above), but at other times, a crocodile or hippo. He often held a cornucopia; in the case of our friend above, it contains fruit. From around AD 69, sixteen small children – representing the sixteen cubit rise in the Nile at its peak – were included. The importance of flooding for the prosperity of Egypt was clearly recognised. Depictions of the Tiber (see below) usually included a she-wolf and Romulus and Remus, a cornucopia, a crown of reeds and often an oar for steering. Sometimes the river had one arm on the prow of a ship, representing the importance of the Tiber for navigation and transportation of goods. The big, important rivers – the Tiber, Nile, Euphrates, Tigris, Danube and Rhine – featured most often in artworks, but coins were apparently the most common medium on which the representations of rivers were wrought. The Tiber, sometimes with his hand on a ship, was most often shown on coins produced by the Roman government. Evidence from the Roman provinces show us that many local rivers were also considered of sufficient worth to make it on to coinage. Traianus. AD 98-117. Sestertius. Rome mint. Struck AD 116-117. Right: Traianus standing facing, head right, holding parazonium and spear; at feet to left and right, seated figures of Armenia, Euphrates, and Tigris (Classical Numismatic Group). Wikimedia commons. For those who have visited modern Rome, especially in the heat of summer, fountains stand out as one of the dominant features of the streetscape. They run continuously, provide cool, clear, drinkable water for everyone and the artwork associated with them is impressive, to say the least. 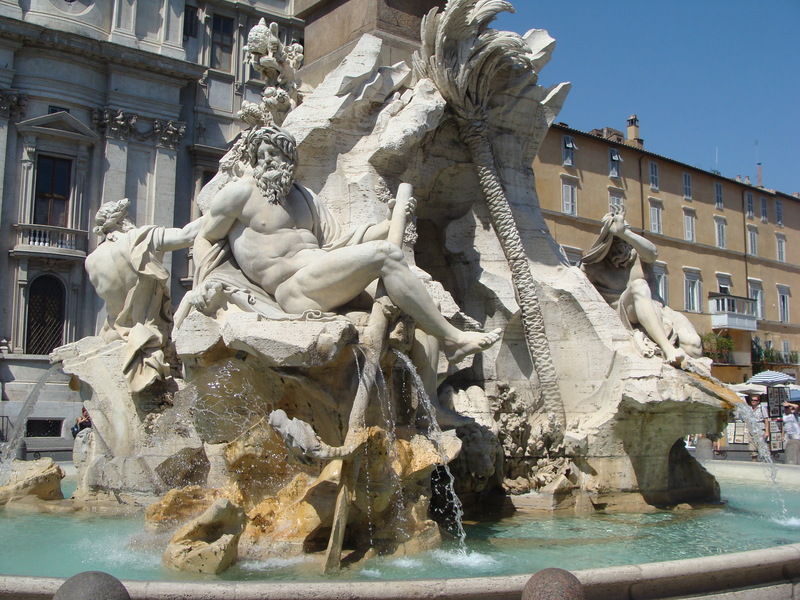 The most famous fountains include the Trevi Fountain, the three in the Piazza Navona, the Triton Fountain and those in St Peter’s Square. But these are much more modern pieces of art (and they will feature in a future post), dating from approx. the 15th Century. As early as the 1st Century AD, however, nine aqueducts were bringing water to dozens of fountains and hundreds of water basins in the city of Rome. So fountains are not a new invention, but the Ancient Roman ones fell into disrepair after the fall of the western Roman Empire and it took centuries to reinvigorate them. Aqueducts are also synonymous with Ancient Rome. They are stupendous feats of engineering, impressive even now, when only a fraction remain standing. Butler (1901) refers to them as “…perhaps the most truly national structures erected by the Romans, simple, truthfully structural, without the pretence of columns or ornamental entablatures.” He doesn’t leave much room to consider their artistic merit. But they have a certain majesty, nonetheless, and a symmetry and regularity which is pleasingly familiar: they remind me of when I was a kid, building arches and towers with Lego and blocks of wood. Perhaps that’s part of their allure. But, seeing as they are artificial rivers and seeing as it is questionable whether they can be considered art, I’ll leave them alone for now. References: Butler, H.C. (1901). The Roman Aqueducts as Monuments of Architecture. American Journal of Archaeology, 5: 175-199. Campbell, J. B. (2012). Rivers and the power of ancient Rome, UNC Press. Evans, H. B. (1997). Water distribution in ancient Rome: The evidence of Frontinus, University of Michigan Press. Taylor, R. M. (2000). Public needs and private pleasures: water distribution, the Tiber river and the urban development of ancient Rome, L’Erma di Bretschneider. This entry was posted in River and History, Rivers, Rivers art, Water and culture and tagged Ancient Rome, Italian rivers, River gods, River Nile, Rivers, Tiber, Water myths. Bookmark the permalink.